What is it about books that makes them so tantalizing? What is it about them that begs to be picked up, to be enjoyed, to be READ? I’m not quite sure what it is…but it is a powerful force. It’s the force that made young Liesel Meminger perform her first act of thievery: picking up a book lying half hidden in the snow by her even younger brother’s grave. What follows in The Book Thief is a masterful tale of the power of written words snatched from snowy seclusion, from a censor’s fire, from a kindly cruel neighbor’s library. The illiterate Liesel is taught to read by her near-illiterate foster father. Liesel reads to the Jew her foster parents are hiding in their cellar. And both the Jew and Liesel write as death looks on. For this story is set within Nazi Germany, while the Grim Reaper is busy across the whole of Europe. The Book Thief is a fascinating story, not the least because it’s narrated by the Grim Reaper himself. “As I’ve been alluding to, my one saving grace is distraction. It keeps me sane. It helps me cope, considering the length of time I’ve been performing this job. The trouble is, who could ever replace me?….The answer, of course, is nobody, which has prompted me to make a conscious, deliberate decision–to make distraction my vacation. Needless to say, I vacation in increments. In colors. Still, it’s possible that you might be asking, why does he even need a vacation? What does he need distraction from? Which in turn brings me to the subject I am telling you about tonight, or today, or whatever the hour and color. It’s the story of one of those perpetual survivors–an expert at being left behind. The Reaper tells the story of all his dealing with Leisel–the Book Thief, as he calls her–from her first act of thievery to her last breath. Along the way, he tells a story of men and women and little girls and boys who risked much and gained much in silent resistance to the Reich. Synopsis:The Grim Reaper tells the tale of a young girl inside Nazi Germany who finds herself enamored with books–and willing to go to great lengths to obtain them. Borrowed from Carrie, who borrowed it from Barbara, who got it from a Booking Through Thursday prompt. Founding Faith by Steven Waldman. I’m always reading several books at once–but I like there to be only one fiction title going at a time. I have a harder time keeping fiction plots and characters straight if I’ve got more than one going at a time. So fiction generally gets read in fits and bursts instead of a few chapters a day like the rest of my reading. Have your reading habits changed since starting a blog? Less often than I’d like. But there are just too many books to be read–and too many IN my comfort zone to keep me busy. Girlie novels (certain Christian romance novelists, chick lit, stuff that’s all about interpersonal relationships), Juvenile and YA fairy tale adaptions, memoirs, sociological type stuff. Okay–my reading comfort zone is pretty wide. It’s easier to say what ISN’T in my comfort zone than what is. What ISN’T in my comfort zone is mysteries, suspense, science fiction, smutty romance novels, and fiction that makes you think. (It’s the fiction that makes you think that I’d prefer to read more of, by the way). What is your policy on book lending? and books that I know the library doesn’t own. Otherwise I direct people to the library. The person I loaned the book to has to be willing to either write notes in the margins or discuss the book with me once they’re done or both! Do you ever write in the margins of your books? Of MY books, absolutely. Generally, though, I only write in nonfiction titles–I write arguments, Scripture references, other thoughts, etc. And, as I mentioned above, I beg anyone I loan books to to do the same. Man, that’s a hard question. I’m not sure what makes me love a book. I just know that I love it. For fiction, if it is well-written, engaging, accurately depicts reality (good and evil, interpersonal relationships, etc. ), and has some cross-genre appeal. Otherwise, I tend to qualify my recommendation as to where it fits within the genre. For nonfiction, if it is well-written, engaging, and addresses a valuable topic in what I deem to be a thoughtful (or at least thought-provoking) manner. Fiction that makes me think. I tend to want to turn off my brain when it comes to fiction–but from my brief forays into fiction that makes me think, I know that it’s worthwhile. I just don’t take/make the time and mental energy to read them. Most inspirational book you’ve read this year (fiction or non-fiction)? I haven’t read much from the “inspirational” front this year. I’ve been more into the “get down to the nitty-gritty, challenge your faith, figure out what you believe” front. Lots of exercising my mind towards the things of God, not a lot of “heart-warming” stuff. How do you feel about giving bad/negative reviews? Not sure how I feel about it. I do give negative reviews. But whether I should, and how I choose which books to review (even though I had a negative impression of them)? I guess I give negative reviews when I think there’s a good possibility that some people could be led astray by the book if they don’t read some truth about it, or if a book had pros and cons, or if I expected a book to be good based on other reviews, book jacket flaps, whatever and was disappointed. Most intimidating book you’ve ever read? Plato’s Republic. I was in sixth grade. I wasn’t intimidated then. I am now! Then, of course, I didn’t feel the challenge of having to understand it. I read it, but didn’t understand it. Now I’m frightened. Most intimidating book you’re too nervous to begin? Tolstoy’s War and Peace and Anna Karenina. Despite reading and enjoying everything my library owns by Tolstoy apart from these two titles, I’m still intimidated. It’s a Russian novelist thing. I’ll get over it eventually. The longest I’ve gone without reading. My sisters shrieking wildly because my brother had just proposed to his girlfriend. Other than that, I am NOT easily distracted. I was one of seven children, homeschooled, in an 1100 square foot house, remember? Favorite film adaptation of a novel? I’d ditto Carrie and Barbara and say Anne of Green Gables: The Continuing Story. I don’t know that you can even call that an adaptation. What would cause you to stop reading a book half-way through? Do you like to keep your books organized? Yes–but the organizational system varies. My fiction is ordered by author’s last name. My nonfiction is ordered by topic. My Biblical reference/Christian living is ordered partly by topic, partly by last name, and partly by what looks good on the shelf :-). My library books are ordered either by size or by due date, depending on how confident I feel that I’ll be able to get everything read before it’s due back! I don’t often get a chance to read my library selections aloud to youngsters. Instead, I read most of my picture books silently, by myself. As a result, most of my reviews of children’s picture books are based on, well, my own opinion of the books and how I think youngsters might respond. But this last week, I had an opportunity to babysit for a couple of my favorite little ones–avid readers at age 4 and 2. Country Crossing tells the simple story of a railroad crossing in the nighttime country. All is quiet except for crickets chirping and an owl hooting. But the a car drives up and is stopped at the tracks. The train approaches and departs. The car starts up again and drives away. And the country returns to its quiet activity. What makes this story unique and repeat read-aloud-able is its use of onomatopoeia and rhythmic language to give the listener a feel for the activity occurring as the car and then the train approach and recede. The illustrations by Ted Rand are old-timey and fairly realistic. I enjoyed reading this one out loud–and the children enjoyed listening and perusing its pages. Went her little mousie toes. The story is enjoyable, with a nice rhyme scheme and an unobtrusive alphabet element. Went run run run run running! That was all she cared to see! Jim Aylesworth’s Book of Bedtime Stories is a compilation of four stories. We started to read these a second time, but didn’t get all the way through due to the kids’ Mommy arriving home. So I’m not sure exactly what appealed; but, like the other two stories, these stories featured a pleasant rhythm and rhyme structure, fun onomatopoeia, and simple but engaging story lines. These stories were a hit with a couple of kids–and this reader wasn’t complaining about the repeats! For more comments on children’s books, see the rest of my Reading My Library posts or check out Carrie’s blog Reading My Library, which chronicles her and her children’s trip through the children’s section of their local library. Read some quotes from the introduction. I’m currently about halfway through and am definitely enjoying this title. I expect to be done with this title by the end of the week. Be sure to check out my notes on chapters 1-9. My ladies’ book club is still moving slowly through this title. Still working on this with my Monday night book club. We’ve had some AMAZING discussion so far. Children’s Picture Books author ASCH-? Drop by 5 Minutes 4 Books to see what others are reading. Not surprisingly, my nightstand is full, packed with a wide variety of library (and a few privately owned!) books. I also have a whole stack of children’s picture books by Verna Aardema. I’ve been in the process of reading every book in my local library for a little over 3 years now–but I’ve been doing it rather haphazardly. Carrie’s system of reading through the picture book section of her library struck my fancy, so I’ve started at the beginning–and the beginning is Aardema. I’ve only read two of her books thus far, but it appears that she generally retells African folk-tales. The pronunciation can be a bit tricky, but both stories I’ve read seem okay. Not great enough that I’d recommend them, but not bad enough that I’d recommend avoiding them. Just neutral. 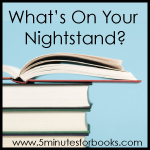 5 Minutes for Books hosts a monthly “What’s on your nightstand?” carnival on the fourth Tuesday of each month. The idea is that you let everybody know what you’ve been reading or are planning on reading this month. It suits me to a T since the books I’m reading are literally on my nightstand. Here’s today’s photo. It’s too depressing to enumerate these. Suffice to say that I’ve got a biochemistry text and a couple of library biochem primers, a book of lab tests (to study for the RD Exam), a text for my program planning class, and a half dozen texts for my counseling class. The mere existence of that cell should be one of the greatest astonishments of the earth. People ought to be walking around all day, all through their waking hours, calling to each other in endless wonderment, talking of nothing except that cell….If anyone does succeed in explaining it within my lifetime I will charter a skywriting airplane, maybe a fleet of them, and send them aloft to write one great exclamation point after another around the whole sky, until all my money runs out. The quote impressed me with the author’s sense of wonderment–and my own lack of such wonderment. The cell is but the least of the wonderful things that I could spend my whole life astonished at. What of the new life being wrought in my friends Jolene and Jennifer as they reach the last trimesters of their pregnancies? What of the orderliness of the universe and the fine-tuning of every law to permit human life? What of the intricacies of weather systems that bring life and death, beauty and destruction? What of the miracle of regeneration? Yet I rarely stop to wonder, much less spend my every day wondering. And I believe I have lost much in my blase grown-upness that thinks it knows the answers and therefore fails to ask the questions. Oh, to embrace wonder once again. To return to the child-like astonishment, that on hearing why the sky is blue, asks yet again, “But why?” For indeed, the first explanation is rarely the end, it is only a springboard for a deeper sense of wonder. May I look at life today through different eyes, through the eyes of wonder. May I take the time to wonder, to be astonished, to gasp in awe at the greatness of my Father displayed through all His creation. May my life be a grand exclamation mark, repeated with every breath–an exclamation mark punctuating the grandness of my God.